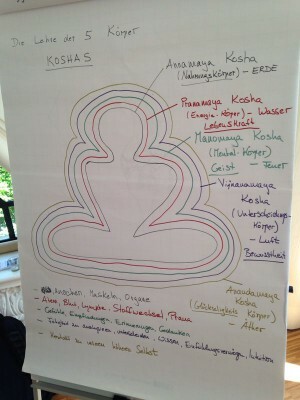 Do you want to deepen your understanding of yoga asana, philosophy and pranayama? Are you ready to awake deep personal qualities to change your life? Do you want to unfold your vision of being and experience this unlimited beauty? Join Vincent Pezet, who will offer you the best support, guidance and inspiration from his own experience and study. He provides a founded curriculum combining the understanding of the methodology and immersing from the practice and teaching experience. 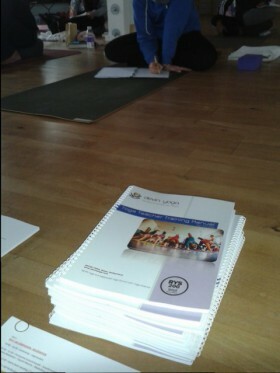 DEVIN SCHOOL OF YOGA is registered Yoga Alliance and offers RYT200 & RYT500 Alignment based Hatha Yoga Teacher Training. This journey will provide you with tools to deepen, integrate and profoundly expand your yoga practice. The yoga practice comes from essential Elements of alignment, body, structure, energy and meditation. This is based on the advanced knowledge of biomechanics combining with the study of the energetic Body and the Philosophy of Yoga. In this series of weekend workshops or as an intensive week of study, we will explore basic postures, breathing and meditation techniques that make up the practice of Hatha yoga. Students will leave with a founded understanding of proper alignment and technique, and will be prepared for most beginner and all level classes. You will be introduced to the History & Philosophy of Yoga, Meditation & Pranayama and the Subtle Body energy systems. The Anatomy basics and the philosophy in the practice of yoga are also part of the Fundamentals series. The Yoga Fundamentals are based on 4 x 2,5days weekend workshop OR as Immersion of 9 days workshop, around 60 hours. Do you want to deepen your own practice? Would you like to share the gift of yoga with others? Are you a yoga teacher wanting to take your teaching to the next level? 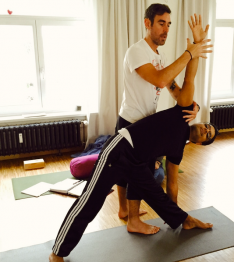 – how can I reach the students as yoga teacher? – how can I support students on the path? 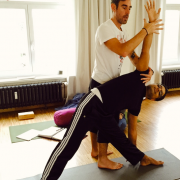 – how can I develop my practice and still be authentic as a yogi and as a teacher? – how can I handle with difficult situations? This training will introduce you to the science and art of teaching Yoga. The training will give you the ability to teach a wide range of poses skillfully and by developing class sequences which will inspire and uplift the practice of yoga students. From a consistent commitment to your practice, you will develop your understanding for the physical, mental and energetical body and integrate the functional anatomy into an alignment based asana practice. Guided by your observations develop skills to support your students into their embodiment and needs. You will learn to use proper verbal instructions as well as hands-on adjustments. Your authenticity will be the inspiration of the Heart based Theme practice. You will develop your physical asana practice as an embodiment of Heart qualities. 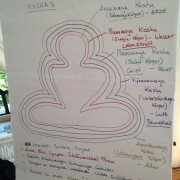 Finally this training focuses on leadership and communication skills as well as ethics and business of yoga. The 200-Hour teacher training meets and exceeds Yoga Alliance standards and is comprised of Yoga Immersion Fundamentals and 2x 9 days on-site weeks, each averaging 60 classroom hours. Combined with 20hours of class observation and assistance. This training concludes with a practical and a written examination. This training and practice schedule requires participants to fully immerse themselves in yoga. Participants should be sincerely interested and ready to study intensively. The course is taught mainly in German, for classes with guest teachers and for reading books and scripts, however, are good English skills required. During the final week of the Art of Teaching, Students will complete a written exam and teach a yoga class. Students will have to complete the observation hours until the last week of the Art of teaching. 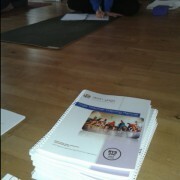 Students who successfully fulfill the requirements of the YTT will receive a Certificate of Completion from Devin Yoga. All classroom hours count toward yoga certification. Upon completion of this training, students may contact the Yoga Alliance for registry at the RYT-200 level. 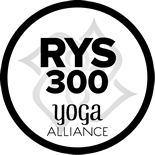 The Yoga Alliance is an independent organization in the United States, which sets high standards as the basis for certification of yoga teachers and is recognized in many countries. Upon completion of training units you will receive a certificate of participation by Devin yoga and so you can register independently on the Yoga Alliance. The Training is composed by 2 main modules : Yoga Immersion Fundamentals & Art of teaching Every part of each modules can be booked separated. Including written course material.Not included are costs for books. The yoga teacher training is at a minimum of 8 people and a maximum number of 16 people.